Bayer Leverkusen went well over the home match with FC Augsburg, score 0-0, winning 4-1 in the last two stages, not with anyone, but with direct opponents to a place of Champions League, RB Leipzig and Eintracht Frankfurt. On Saturday, the Leverkusen group had a very good performance in the second half of the game with Eintracht Frankfurt, which beat 4-1 (Julian Brandt 20, Kevin Volland 71, 88, Karim Bellarabi 77 – Marco Fabián 23) . After 30 rounds played in the Bundesliga, the team trained by Heiko Herrlich is ranked 3rd in the standings with 51 points. “Die Werkself” made a huge step to the Champions League after winning with RB Leipzig (4-1, away) and Eintracht Frankfurt (4-1 at home). With 4 stages before the end of the season, the “aspirins” have the same number of points as Borussia Dortmund, 4 points ahead of RB Leipzig and 5 points of the 1899 Hoffenheim and Eintracht Frankfurt TSGs and will normally play in the Champions League autumn. Bayer Leverkusen also reached the semifinals of the German Cup, a one-time competition in the 1992-1993 season (1-0 with Hertha BSC amateurs). Bayer 04 played two finals, being defeated by FC Schalke 04 (2001-2002, 2-4) and SV Werder Bremen (2008-2009, score 0-1). This season, Bayer Leverkusen eliminated Karlsruher SC (3-0, after overtime, away), FC Union Berlin (4-1, home), Borussia Mönchengladbach (1-0, away) and Werder Bremen (4- 2, at home). In the semifinals, Bayer 04 will play with Bayern Munich champion BayArena home and taking into account the good shape of the last stages will try to eliminate the Bavarians and qualify for the final. The hosts can not count on midfielder Sven Bender, Brazilian left defender Wendell and Finnish striker Joel Pohjanpalo who are injured. Borussia Mönchengladbach had the nerve to open the score on the Allianz Arena in the match with Bayern München through Josip Drmić (9), which furiously championed the champion, who scored 5 times through, winning with the score of 5-1 . 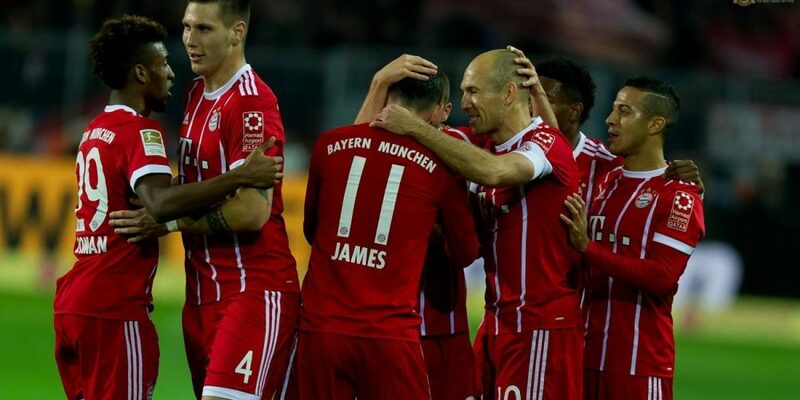 The goals were scored by Sandro Wagner (37, 41), Thiago Alcânta (51), David Alaba (67) and Robert Lewandowski (82). After 30 rounds played in the Bundesliga, the team trained by Jupp Heynckes is ranked No. 1 with 75 points, 20 points more than FC Schalke 04 and 24 points with Bayer 04 Leverkusen. The Stern des Südens have already won the title, but have two goals this season, winning the German Cup and especially the Champions League, where they will play on April 25 with Real Madrid. FC Bayern München won the German Cup 18 times, the last time in the 2015-2016 season, when he defeated Borussia Dortmund after the penalty shoot-outs (0-0, 4-3p). This season, “Die Roten” eliminated Chemnitzer FC (5-0, away), RB Leipzig (1-1, 5-4p, away), Borussia Dortmund (2-1, home) and SC Paderborn 07 (6-0, away). “Der FCB” is already champion, but wants to win this season “triple” – the championship, the German Cup and the Champions League, so the technician Jupp Heynckes will not keep the holders, especially that the match with Real Madrid will be next week. The guests can not count on the far left Kingsley Coman, who is injured in the ligament, while the Chilean midfielder Arturo Vidal is uncertain. Goalkeeper Manuel Neuer, who has long been unavailable due to a fracture of the metatarsiele bones, has returned to training.